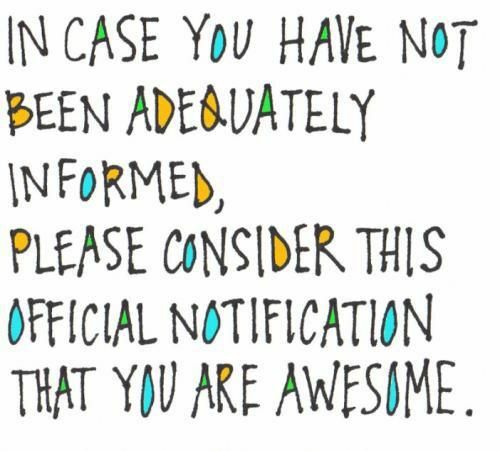 I think it has been a while since I told you that you’re awesome, and I think it is important that you hear that fairly regularly. Did you know that awesomeness is contagious? Chances are that if you are the boss, nobody ever tells you and if you are an employee, nobody tells you either. Most people I meet are overworked and underappreciated. Now here is the thing, the worst behaviour in any organization is there because it is accepted. Why do people go to a job day after day, week after week, month after month, year after year, in which they work hard and long hours, and they tolerate that nobody seems to see their value? Self-worth and self-confidence is important. If you are someone whose focus is mainly on business results, I can tell you that the self-worth of a person is in direct correlation with the net worth of the company. Ouch. What would it take to make it part of your day to recognize and appreciate the people around you? your spouse that he / she is awesome and why! your children that they are awesome and why! your friends and neighbours that they are awesome and why! your boss that he / she is awesome if he /she has earned the right to hear it. your employees more often that they are awesome and why! your co-workers that they are awesome and why! It’s so much fun to be a confidence booster. Now go and be awesome. Awesomeness is contagious.